Cruise the sparkling turquoise waters and evocative coastlines of the Italian, French, and Spanish Rivieras and explore the dynamic history, art, and culture of the region. With Smithsonian, we can be confident not only of an excellent trip, but of a wonderful group of fellow travelers to share it with. 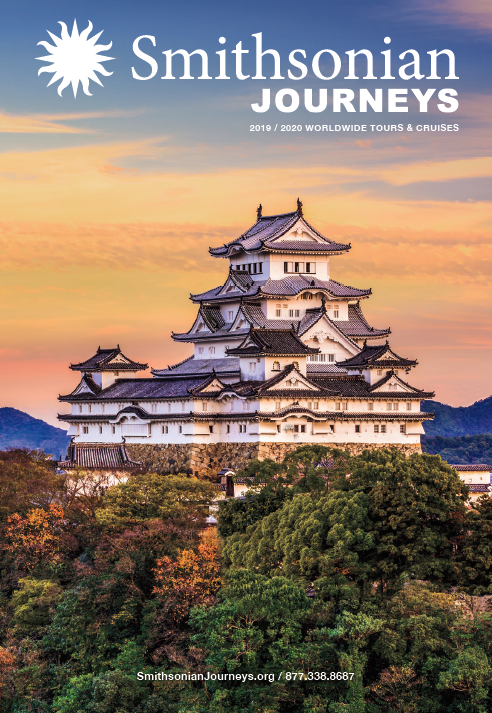 Save $1,000 per person when you book by May 28, 2019! The sparkling turquoise waters and evocative coastlines of the Italian, French, and Spanish Rivieras enticed the Greeks and Romans to settle here. Later, 19th-century Europeans came on the “Grand Tour,” Italian nobility influenced new developments, and artists and writers were drawn to the radiant quality of the light and the region’s glamour. 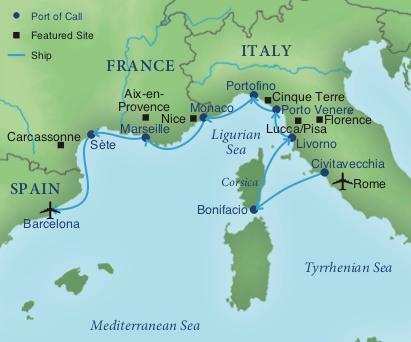 Come with us on this special cruise, which showcases the history, culture, and art of the western Mediterranean. Corsica: Delight in the vistas of coastal villages, stylish villas, and rugged landscapes rising from azure waters and enjoy a walking tour of Corsica’s Bonifacio. Florence or Pisa and Lucca: View the rolling hills of Tuscany en route to Florence, the birthplace of the Renaissance, where you’ll admire masterpieces by Michelangelo and see the work of Brunelleschi and Ghiberti at the famous Duomo and Baptistery. Or, visit the beautifully preserved medieval cities of Lucca and Pisa, just a short drive from the port of Livorno. Cinque Terre and Portofino: Board a small boat to explore the Cinque Terre, a World Heritage site comprising picturesque villages, stopping to visit lovely Vernazza and Riomaggiore. Spend a leisurely evening in Portofino, a fishing village of pastel houses that now attracts the glamorous with their sleek yachts. Nice: See the hill of Cimiez and its Monastery and enjoy a panoramic view over the town, and see the Promenade des Anglais and Massena square before arriving in Nice's Old Town for a walking tour. Monaco: Capture the essence of the Côte d’Azur during a walking tour of Monaco. Marseille and Aix-en-Provence: Enjoy a walking tour of the Old Port of Marseille, once used by ancient Greek ships. Drive north to Aix and discover the Old World mansions and ornate fountains of the Cours Mirabeau, plus the Old Town Hall and St. Sauveur Cathedral. Carcassonne: Tour this well-preserved World Heritage site, once home to Romans, Visigoths, Persians, Franks, and other peoples. Plus travel to the nearby 12th-century Cistercian Abbaye de Fontfroide. Barcelona: Conclude your voyage to the city of Antoni Gaudí. Dock below the ancient town of Bonifacio, overlooking the sparkling harbor from sheer white limestone cliffs at the southern tip of the island of Corsica. Often referenced by historians as a site portrayed in Homer’s Odyssey, this beautiful port’s fundamentally French character bears a strong Italian imprint, manifested in the islanders’ French-Italian dialect. Transfer by small train for the walk through the incredibly picturesque medieval citadel and Old Town. Stroll the Rue des Deux-Empereurs, where Charles V and Napoleon once lodged, and see the Gothic Church of St-Dominique and the famous Grain de Sable limestone formation. Enjoy the rolling Tuscan landscape of vineyards and cypress trees en route to Florence, birthplace of the Renaissance. This iconic World Heritage site is a treasure trove of unparalleled achievements in art, architecture and literature. Admire Michelangelo’s David, considered one of his greatest masterpieces; Brunelleschi’s soaring dome at the Duomo of Florence; and Ghiberti’s moving Doors of Paradise, the magnificent bronze-cast entryway to the Baptistery of San Giovanni, depicting scenes from the Old Testament. From Porto Venere’s small harbor, board a private boat cruise and dock in two villages of the famous, picturesque Cinque Terre. This World Heritage site is a series of charming, colorful fishing villages that cling to remote cliffs overlooking the Ligurian Sea. Discover the spectacular nuances of Riomaggiore and Vernazza, linked by walking paths that offer marvelous views of the charming coves, hidden beaches and terraced vineyards that produce the famous dessert wine Sciacchetrà. This morning set out on a panoramic and walking tour of picturesque Nice. See the hill of Cimiez and its Monastery and enjoy a panoramic view over the town, and see the Promenade des Anglais and Massena square before arriving in Nice's Old Town for a walking tour. See the Palace of Kings of Sardinia, Baroque churches, narrow streets and sunny squares. The principality of Monaco’s dazzling historic district, Monte Carlo offers an intoxicating mixture of princely sights and intrigue. Admire the legendary belle-époque architecture and enjoy a walking tour on the historic Rock of Monaco. See the changing of the guards at the Prince’s Palace, home of Europe’s longest-reigning dynasty, and visit the neo-Romanesque St. Nicholas Cathedral, where Princess Grace is interred. Nearly three millennia of maritime heritage thrive in Marseilles, the 2013 European Capital of Culture and a natural port where ships have docked since Greek settlers first arrived in 600 B.C. Enjoy a panoramic tour featuring the historical heart of the city, its Old Town, the majestic 19th-century Cathédrale de la Major, the opulent Notre Dame de la Garde with its neo-Byzantine interior and extraordinary city views from the grounds, and the Vieux Port (Old Port) which some consider to be the birthplace of Marseilles. Drive on the picturesque Corniche Kennedy, a meandering boulevard overlooking the sea dedicated to the late United States president, and travel along the historic high street, Canèbiere, built by Louis XIV in 1666. Settled on the former frontier between France and Spain along ancient trade routes linking the Atlantic with the Mediterranean and Iberian Peninsula and occupied since the sixth century B.C., Carcassonne was fortified by the Romans, conquered by the Visigoths in the fifth century, captured by Persians in the seventh century, later invaded by Franks and overrun by Barbarians. Each of these civilizations left their indelible influence on the extraordinary architectural and artistic heritage of this city over the centuries, and the medieval core of Carcassonne that remains today is an extraordinary World Heritage site. Walk the cobblestone streets, admire the drawbridges and watchtowers and appreciate the joyous ringing of bells that evoke its Gothic and medieval past. Travel to the nearby Corbières Mountains to tour the well-preserved, 12th-century Cistercian Abbey of Fontfroide. Day 9 —Barcelona / Depart for the U.S.
Disembark the ship in Barcelona and continue on the Barcelona post-tour extension option, or depart for the U.S.